Hike high into the Rees Valley, camp out in our wild campsite, then paddle out the next day. Sports scientists call it active recovery, we call it chicken soup for the soul. Our private campsite is situated in a beautiful grassy clearing with views of the night sky, sounds of running water, and absolutely no distractions from the natural environment. We’ll pack in plenty of action, along with a good dose of time to relax and soak up the serenity. At Muddy Creek we throw on our backpacks, which are much lighter than you might expect. Much of our camping gear will be on site to meet us, so with just packrafting and personal gear, we hope to have packs under 15kg. We follow a Department of Conservation walking track, before leaving the beaten path and cruising up the river flats. It’s unlikely that we’ll see any other people, but we will share the valley with deer, cattle and sheep, who are lucky enough to spend their summers on this picturesque high country station. We know that refuelling is half the pleasure of exercise, so we’ll carry a big picnic lunch to keep us going. And there’s is no better place to enjoy a picnic than underneath a 175m waterfall. 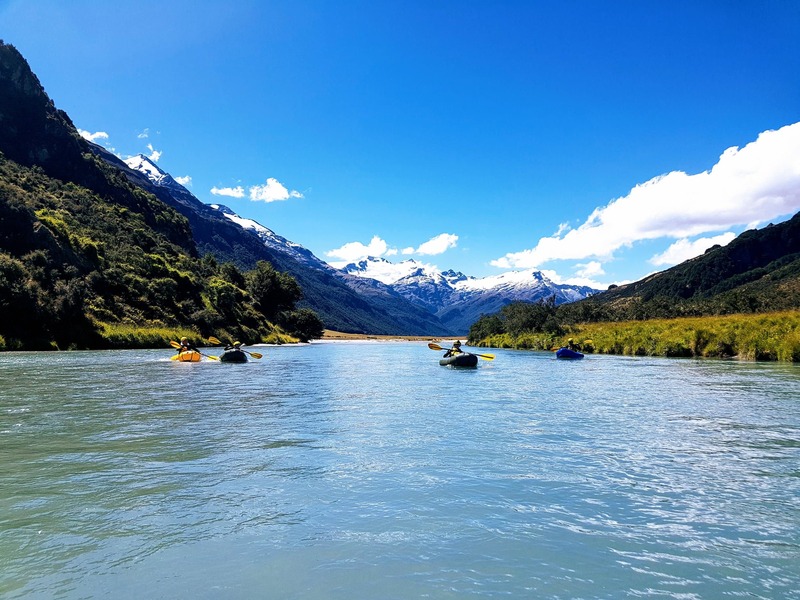 After lunch, we walk further upstream to the very edge of Mount Aspiring National Park, where the first major tributary flows into the Rees River. After dumping our camping gear, we blow up our rafts and enjoy a couple of kilometers of easy paddling to prepare us for the next days packraft. By mid-afternoon we arrive at camp, and your guide gets busy setting up everything up. Meanwhile, everyone else is free to leave their backpacks behind and enjoy the surroundings. This is your time to simply be, in a supremely relaxing environment. You might consider bringing a book, frisbee, practicing some yoga, take some photos or whatever floats your proverbial boat. We’ll have dinner and desert ready for you. And depending on the conditions, we might even be able to have a small fire to warm our toes. At camp we’re long way from civilisation, but we still manage to provide a few creature comforts, like an environmentally friendly toilet in a dedicated, private tent. When morning comes around, we ready ourselves for the day, with the assistance of coffee and hot porridge. Then we’re off downstream again. The river is a combination of gentle grade-1 rapids and flat, flowing stretches. There’s plenty of opportunity to snap photos, or to lie back and look up at the mountains. This is a supremely relaxing float. 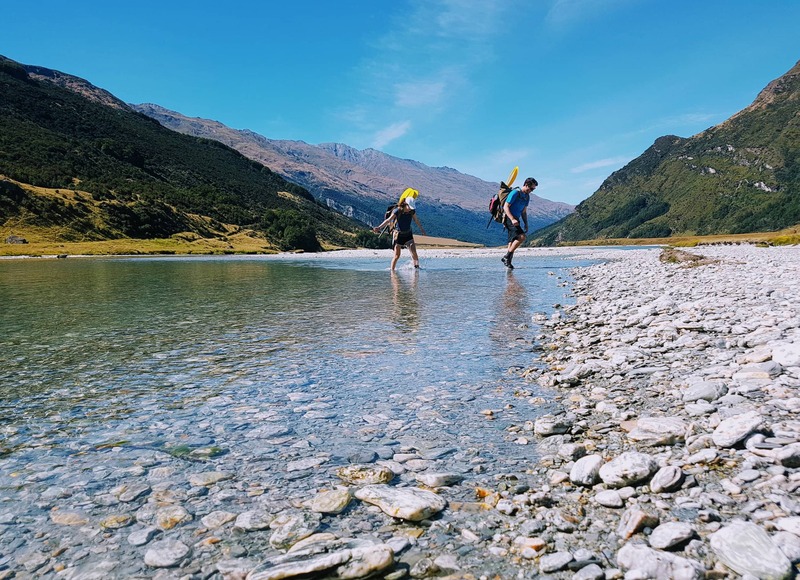 Leaving is always hard, particularly after an immersive experience like this, but we’ll get you back to Queenstown by early afternoon - plenty of time to step off into your next adventure. Forget the apple. This trip is just what the doctor ordered.